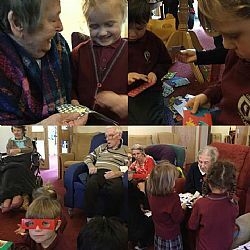 If you have been following the updates on our intergenerational project at our Royal Bay nursing home, Claremont Lodge, then you will know that the wonderful pre-school children from Great Ballard School were due for their bimonthly visit in April. Once a month the two groups get together to take part in a great range of fun activities from Valentines tea parties to arts & crafts - there is something for everyone, and of course we must not forget the annual visit from the Easter bunny! In April the West Sussex Royal Bay care home was full of excitement as the annual Easter egg hunt got underway. After a quick visit to the recently hatched ducklings, the excited youngsters from Great Ballard School searched every inch of our spacious care home hunting for Easter eggs. We receive fantastic feedback from everyone involved in our intergenerational project, both the children and the residents gain hugely from integrating together and research shows the benefits to both sides.